You may have heard of Heather Brooke: she’s one of the campaigners who got MPs’ expenses and spending put into the public eye through the Freedom of Information Act and a great deal of determination. That “fetishistic” sums it up perfectly. Just as “health and safety” has become the refrain for anyone trying to stop someone else doing something in the physical world, so “privacy” has become something that is used to block anything that might disrupt the status quo. But disrupting the status quo is what Brooke, and indeed the Free Our Data campaign, are all about. It’s difficult, changing peoples’ mindsets: but if you keep pointing out that things are wrong about how it’s being done now, eventually you set up enough cognitive dissonance that something does happen. Brooke has done a huge amount to that end with MPs’ expenses (even though some are now trying to squeeze around it). We find common cause on data like this. The struggle continues. 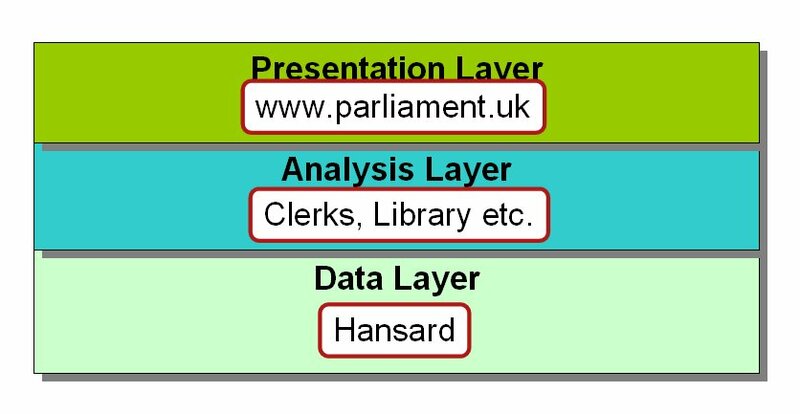 Richard Allan and Tom Watson – the former a former Lib Dem MP who is now chair of the Power of Information Taskforce, the latter a Cabinet Office minister who set up the taskforce – have set up a blog for news of the progress that the taskforce is making. It’s fascinating stuff, and we’ve been remiss in not noting more of it here. For instance, there’s a proof-of-concept for crime mapping, including a presentation where the slides say things like “Is it safe to park my car here?” “Has crime in my area gone up or down?” and “How can I do something about it” – for as it points out, “Call to action [is] almost completely missing in existing mapping propositions”. I’ve seen this … the Met Version. Working. With real data. The only thing that concerns me is that a visual representation will encourage house prices in certain areas to go into freefall as the red areas (high crime) are highlighted. Funnily enough anywhere near a train station (Underground or National) seems to have higher ratings than other parts of the boroughs but overall the map has average crime levels. Get on and add it to your feeds. This is important stuff. And, even more importantly, it’s government being done transparently: when you can see what people are thinking, it helps you to influence it. Police forces are due to provide standardised local information on crime, starting from Summer 2008, as part of the Government’s new crime strategy3. Some are already providing local information but what will be available from the Summer of 2008 is likely to remain highly variable. We hope police forces will draw on the evidence in this review to develop the information they provide over the next year. •et; 87% wanted to see the same format used by all forces for the information they provide. “We plan to publish monthly local crime data and we will take forward the report’s recommendations on local crime mapping and making sure every household receives ‘Crime Watch’ style information about the local fight against crime. Not sure where that leaves police officers like Brian Paddick who think it’s all too unbearable to countenance the public seeing crime data. But the idea has now been so thoroughly floated, it’ll be next to impossible to simply bury it. There are of course wrinkles. Stuart Grimshaw, who tipped us off to this announcement, has written a letter to his MP asking what formats the data will be provided in. Which matters, rather a lot. Do we want to scrape PDFs or websites? 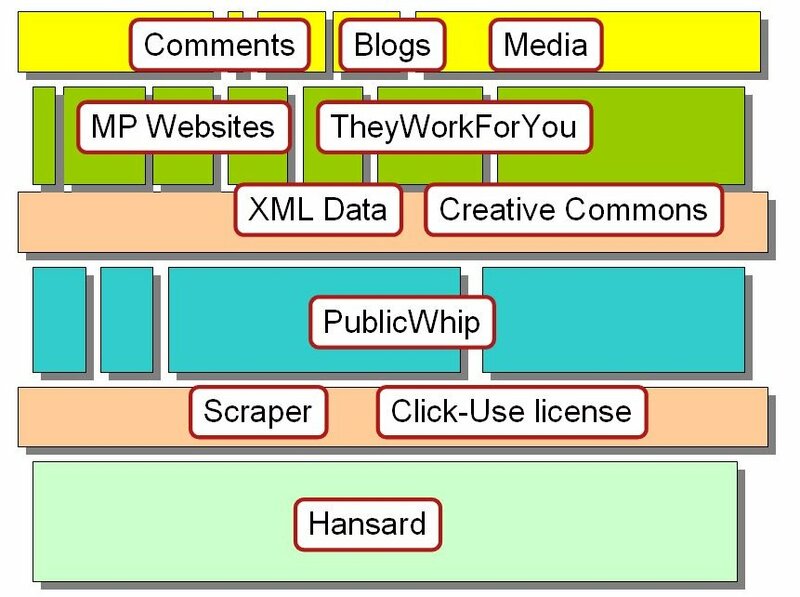 No, we want a decent XML feed, please. Not hard. Perhaps the police could be issued with geotagging systems – take a photo at the crime, send it with geotags (which can be done with GPS-enabled phones). Aggregate data, remove precision as required by class of crime. Send to web server with RSS output. Job done. The BBC’s iPM – the radio programme whose topics are suggested (though “chosen” would be overstating it) by its listeners – has looked at the topic of crime mapping, investigating how it’s done in Chicago. There are two pieces: talking to Everyblock, the followup to chicagocrime,.org (which did the original crime mapping idea, building on the release by the Chicago police of the crime location data); and then talking to Jonathan Lewin, information services division commander in the Chicago police’s official crime mapping effort, and its GIS manager Joseph Kezon. You’ll have to visit the page to get the audio. Not everyone, of course, is happy with crime mapping. On the programme this weekend we’ll hear from groups who worry that crime-mapping could be counter-productive, affecting house prices, increasing fear of crime, and leading to areas being stigmatized. I live in Surrey and we only have 10 police officers and all the police stations have been closed. They appear once a year for a major event and then we don’t see them again for 12 months. We do have a helicopter, loads of speed cameras, town centre cameras and a new video speed check van. I think the police had a choice of more police on the beat or the helicopter and they decided that the helicopter looked like more fun. It hasn’t caught any criminals yet but they will produce statistics at the drop of a hat to assure you it is essential to crime busting. The helicopter is very annoying and it would be useful to know the areas where it flies so potential house purchasers could avoid these areas. It flies around and around in pointless circles until residents are forced to report crimes in the next district so that it will fly away. Don’t get me wrong, I don’t want more police on the beat. I want them to sell the helicopter and give me my money back. Yup, helicopters are expensive to run. Maybe if there was a crime map you could decide where it should go more quickly..? The more things seem to change with government-collected information, the more they really stay the same. The latest example: surgeons’ deathrates, which will be made public under a new NHS scheme. Except that, as we point out in NHS plans to reveal surgeons deathrates online in today’s Guardian, the data won’t be in a very usable form (at a guess, it’ll be a stack of PDFs – not even Excel files). And you’ll be banned from reusing it in any meaningful way. NHS Choices is one of the government’s most lavish web projects, designed with web 2.0 very much in mind. Among other services, it promises “a social network for health”. A strategy published earlier this year says: “When people want to comment directly on their experiences of particular services, whether positive or negative, NHS Choices will become their first port of call.” The two-way information flow “will empower people to make informed decisions about their health and social care”. Nevertheless deathrates have a basic utility: it could have helped, for instance, to more quickly identify the Bristol heart babies’ abnormally high deathrates. The data will need to have extra information, clearly, about what sort of operations were being done; simply saying “Surgeon X: deathrate Y” is inimical and useless. 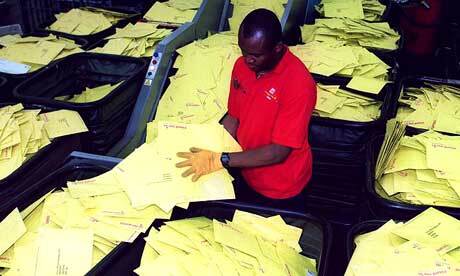 We’ll have to see..
A Royal Mail worker sorts envelopes in the 2001 census. Copyright: The Guardian. In this week’s Guardian Technology we look at the 2011 census – and beyond: the Commons Treasury Select Committee produced a report earlier this year pointing out that the £500m 2011 census is being hampered by rows between the Ordnance Survey, Post Office and local authorities about who owns the intellectual property in addresses, as the Office for National Statistics needs a comprehensive, accurate national address register to carry out its work. The article, Traditional census is ‘obsolete’ also looks at what could follow: a rolling census carried out by noting peoples’ movements through address registers and so on. Angela Eagle, exchequer secretary to the Treasury, was pressed by Mark Todd, the Labour MP for South Derbyshire who sits on the committee, over the failure to create the register – particularly because, as he repeatedly pointed out, all the intellectual property lies within the public sector. Eagle responded that: “I would not underestimate the difficulty of the issues surrounding [a single national address register].” Todd suggested that a Gordian knot approach – cutting through the complexity at a stroke of legislation – might work. “We can all hope,” Eagle responded. But in the meantime, the government’s Office for National Statistics (ONS) will prepare its own register – a needless duplication. The Free Our Data campaign would certainly back a Gordian approach: slice through the 10 years of rows by making the data available for free, without copyright restrictions, where they are gathered by government-owned organisations. While Todd is no fan of the free data model, we can all agree with his frustration at the way that rows about data owned by public-sector organisations are holding back the development of another public-sector resource, an accurate census. The report recommends that the government “remove any outstanding obstacles to the production of an address register”. You can find the Treasury select committee report here. An interesting exchange in the Commons between MarK Todd, who has some interest in matters of data availability (though we must point out he disagrees with the free data theorem – though, then again, he hadn’t finished reading the Cambridge economics report when we spoke to him earlier this week). Mark Todd: To ask the Chancellor of the Exchequer what arrangements exist for the Valuation Office Agency to make the council tax list for England and Wales available to third parties for value-added use; and if he will make a statement. Jane Kennedy: Council tax valuation lists for England and Wales are available to search on the Valuation Office Agency’s website at no cost. Full copies of lists are not otherwise available without a statutory gateway. Mark Todd: To ask the Chancellor of the Exchequer pursuant to the answer of 6 May 2008, Official Report, columns 817-8W, on council tax: valuation, whether a statutory gateway will be introduced. Jane Kennedy: Statutory gateways exist in so far as they are provided by Commissioners for Revenue and Customs Act 2005 and other legislative provisions. This Department has no current plans to introduce further gateways. I asked Mark Todd what the thrust of these questions was. He explained that he has constituents who are interested in finding out the value of houses in areas. They can get that data from local councils, in the form of the council tax valuations (which date back years). Except you can’t get it in bulk – unless you go in person to the council. So there’s no obstacle to getting the information. The obstacle is to getting it in bulk. And the government isn’t going to make it easier to get. This is puzzling to Mr Todd. And to us, to be honest. There’s value there, but it’s being kept under wraps. Why? The Post Office is in dire straits because too few companies are using its services to send letters. Companies that want to sell you stuff like addresses of people who fit their demographics. Yes, you can call it junk mail – but it’s easy to ignore. (I got a ton because I had a planning application on my house: lots of companies picked that up and sent me letters advertising their wares.) Even so, it’s all money for the Post Office. Mr Todd will, we suspect, pursue this strange reluctance on the part of the government to find ways to make a bit of money from its information. He may think it should sell it. We think it would make better sense to make it free and let companies benefit from using it. But even if the ends are different, we have a common cause. We’ll watch this with interest. Points to note: the ICO does not come out against it, explicitly. It says that there is a need to balance benefits and risks. To be honest, it is vague to the point of pointlessness. It seems likely the ICO hasn’t looked at this, even though it’s been in the Tory manifesto, and of course here on our blog (aren’t we required reading for the ICO?). The Observer newspaper has an article today by Nick Cohen – a truly criminal approach to policing – which looks at the broader question of policing, and how setting targets can have a negative effect on other aims. It seemed worth quoting in the context of the earlier discussion about why the Met police appear to be against crime mapping (even if other regions have dipped their toes in). Last week, Harriet Sergeant of Civitas described a police service which was close to incapable of doing its job. In a think-tank pamphlet, she delivered a devastating condemnation of an enclosed and self-referential bureaucracy which operated without regard to the wishes of the people who paid for it. We now spend proportionately more than any other developed country on policing, she pointed out. The Home Office used targets to run it and delivered funding and bonuses to chief constables who filled its ‘sanction detention’ arrest quotas. The first perverse consequence was that although the public expected the police to keep the peace, an officer who successfully stopped trouble was not rewarded because no trouble meant no arrests. More seriously, the police played the Home Office game by going for trivial offenders rather than serious criminals. Solving the case of a child who steals a Mars bar earned as many points as solving a murder. It made more sense to arrest rowdy children for ‘harassing a tree’ than to begin the hard work of tackling a potentially homicidal teenage gang. Chris Dillow, author of New Labour and the Folly of Managerialism, describes Brown’s Mullettry as a marriage between Old Labour’s Fabian belief in the centralised state and Thatcherites’ worship of management consultants. Between them, they have spawned a bureaucracy which despises democratic accountability and, worse, does not and cannot work. The whole article’s worth reading and considering while asking the question: would this police force want to release the data on crime mapping? You are currently browsing the Free Our Data: the blog weblog archives for June, 2008.